Pictures from Day 2 of the Enduro World Series on Sunday in Snowmass Village. Aspen Snowmass and the Snowmass Bike Park are set to host the 2018 Big Mountain Enduro Finals this weekend. The fourth and final stop on the BME circuit, Saturday and Sunday will feature five or six stages that will decide the season-long champions. New this year, the Snowmass race also is part of the Enduro World Series Continental Series, a feeder system into the elite Enduro World Series. 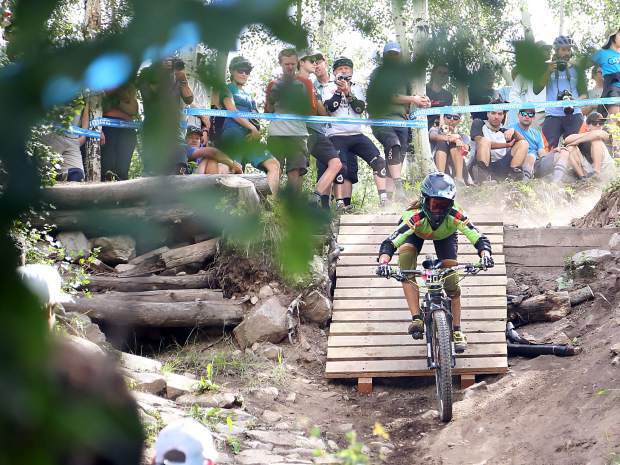 The Enduro World Series held one of its stages in Snowmass last summer. The exact stages for this year’s event in Snowmass are expected to be announced today, with official practices scheduled for Thursday and Friday. The Enduro World Series event last summer had six stages, with one being held on Aspen Mountain. So far this summer, Big Mountain Enduro has held races in Santa Fe (May 26), Crested Butte (June 23-24) and Keystone (July 7). A form of downhill mountain biking, enduro requires athletes to use energy by pedaling to the start of each stage before a timed descent. Winners are determined by their overall combined times on the downhills.